Water pH, or “potential for hydrogen”, is a measurement scale used to determine the acidity or basicity of a liquid solution. The scale ranges from 1 to 14, with 7.0 being considered neutral. In regards to garden ponds, a safe pH range would be between 6.0 to 8.5, but a range of 6.8 to 7.8 would be even more ideal for ponds with fish (especially koi). The only way to know your pond pH is to physically test the water using a testing kit or an electronic reader, but this is typically only necessary if you feel there is a problem with water quality. Most ponds will naturally fall within the safe range and never see any large spikes or drops in pH, but you should still be on the look out for tell tale symptoms! For example, if fish become sluggish, sick, or start to die, this could mean there has been a rapid change in pH which needs to be checked. Other symptoms include sudden changes in water clarity, odor, or an overgrowth of algae. 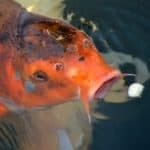 An increasing pH is very dangerous to pond fish, as it directly affects the toxicity of a waste chemical called ammonia, with rising pH making it far more potent. With that said, the pH of a pond should never be rapidly adjusted with chemicals as this can also be very dangerous to fish. Daily pH fluctuations should be no more than 0.8 a day for fish ponds, and a stable pH within the “safe range” is always more ideal than a constantly changing value. What causes high pH in ponds? Algae is just one of many reasons your pond may see a change in pH as it removes CO2 from water. A rising or high water pH in a pond is much more common than a lower pH. The higher pH means the water is becoming alkaline, and the cause for the rise is often substances leaking into the water from the ponds surroundings. A higher water pH can become especially dangerous for pond fish, as both high pH and high temperatures will increase the toxicity of ammonia in water. Ammonia is already toxic to fish, but the bulk of ammonia is generally removed through normal filtration by beneficial pond bacteria. Problems occur when both pH and temperatures spike, and the potency of ammonia increases two-fold. In situations such as this, fish will rapidly become sick and can even die within days. The most common cause of increasing water pH is from the leaking of toxic lime from uncured cement pond embankments. If you have a cement pond, the cement should be properly treated before installation to prevent substances leaking into water. Often cement is not treated, however, and there is a gradual increase in lime leaking into the water causing pH levels to rise. This same scenario can occur from bricks, mortar, or ornaments around the pond, and is not just limited to cement ponds. As it rains, untreated materials may slowly leak chemicals into pond water which will begin to alter the pH of the water. Another common reason for a rising pH is from the rapid growth of algae. During the day algae will use sunlight and carbon dioxide for photosynthesis, and the removal of large amounts of carbon dioxide can cause an increase in water pH level and drop in acidity. Algae should be maximally treated if you have a bloom before you begin adjusting pH values. The only way to determine if you have a high or low water pH is to test! Common commercial water test kits are generally color-coded and only provide a wide range pH measurement. This is generally within a scale of 4.0 to 9.0, with increments of 0.5 for each color. These tests are fine for most purposes, and they can at least give you an idea where your pond sits in the pH range. If you want more accurate pH measurements, to a resolution of 0.1 or 0.01, you’ll need to invest in an electronic pH tester. These only test solutions for pH, but they have the advantage of being able to provide measurement values up to 2 decimal points. Either choice would be fine in most cases, so you can just choose the option that is the most convenient or cost-effective. Alongside pH testing we also recommend testing for water KH, as this acts as a buffer that stabilizes (or destabilizes) pH in water depending on the range. A change in pH can be directly related to KH, and to re-stabilize pH you may need to also adjust water KH. For more information on water testing and our recommended test kit choices, see our full guide here. If you sudden experience spikes in pH or a gradually rising/falling pH reading, you should check the KH (carbonate hardness) of your pond. KH is essentially an indicator of the number of dissolved bicarbonate and carbonate ions in the water which work as a buffer, preventing rapid changes in pH. The ideal KH range is between 125 and 200 ppm, and a result much lower than this range is likely the culprit causing the swing in water pH. Since rapid changes in pH are very dangerous, the best way to start lowering your pH would be to first stabilize your KH levels in water. We recommend rising KH levels if KH drops below 125 ppm or you see pH changes above 0.8 points each day. An algae bloom is a common cause for high pH during the day as algae consumes carbon dioxide and other inorganic compounds for photosynthesis. If your pond looks very green in color, an increase in pH and rapid changes of pH between morning and night is very likely caused by algae. Before trying to adjust the pH of water, the maximum amount of algae should first be removed from the pond. For most types of ponds, especially those with fish, we always recommend a UV clarifier for algae removal and control. UV clarifiers, unlike algaecides, are very safe for fish and are also very effective at controlling free-swimming green water algae. Running a clarifier for a few days should clear almost all green algae, and then the water can be re-tested to see if pH has stabilized and lowered. Sometimes the removal of algae is enough to bring pH down and stop rapid changes occurring between the morning and night. After your water KH is in the range of 125 – 200 ppm and algae is under control, you can consider lowering your pH using a safe acid compound. Before doing this we recommend testing your pond water pH in both the morning and night for a few days. If your pH readings are within 6.8 – 8.5 and there are no major swings each day (more than 0.8), you likely do not need to lower the pH further. A stable pH is more important than a changing pH, and as long as the pH is within the safe range it should be fine for pond fish. If your KH is stable but your pH is above 8.5 and you want to lower it, we suggest a “pH down” product. These products contain bio-safe compounds which slowly increase the acidity of the pond water. The benefit of using these products is that they have already been tested for fish safety, and they generally only adjust pH by very slow amounts. Gradually lowing your pH is better than a rapid decline, and most of these treatments only lower by 0.2-0.5 in 24 hours. We recommend PondCare’s pHDown formula for safe pH lowering in ponds. This product contains low dose sulfuric acid which will help neutralize alkaline substances and lower the pH of water over time. After dosing and waiting 24 hours, it is advised to re-test pond water in the morning and night to see the new pH values. If pH needs to be lowered further, a repeat treatment can be applied to the pond. Muriatic acid (hydrochloric acid) is an extremely strong acid and I would personally not recommend using as it has a high chance to produce massive pH crashes – which would be deadly to fish. The only time I could see it being helpful would be in much larger bodies of freshwater, such as for use in lakes. In ponds it would simply be far too difficult and risky to dose safely, especially if you have fish. How do I lower the water ph in my Fish pond. Lowering pH can be tricky, especially if you have high KH/alkalinity acting as an acid buffer. How high is your current pH? Do you know your KH parameters? I have a pH level of 9 in my pond can I use to lower the pH. Will citric acid be of any help? Citric acid is a fairly weak acid, and so if you also have a high KH/alkalinity buffer (common with high pH) it may not be enough to lower that pH reading. Out of curiosity, have you performed a KH/Carbonate-hardness test? What are your other water quality readings like, such as ammonia and nitrates?